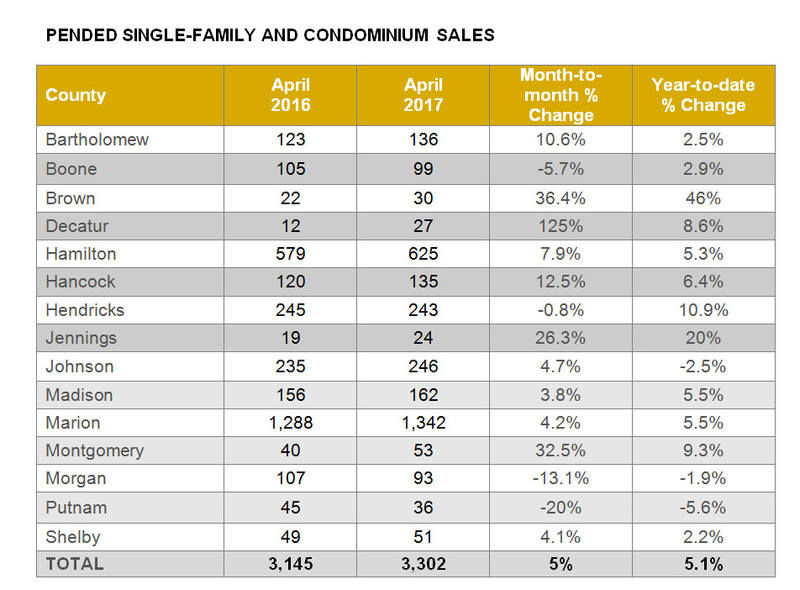 Monthly real estate stats from F.C. 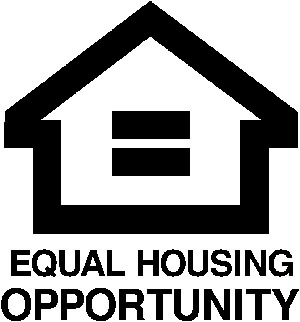 Tucker Company indicated that the housing market is still not slowing down. August 2017 pended sales climbed 3.2 percent compared to August 2016. Similarly, the average year-to-date home price for the 15-county Central Indiana region rose 6.6 percent to $199,498. Montgomery County showed significant growth in homes sold, a 27.3 percent increase in August 2017 compared to August 2016. Decatur County followed next behind with a 15.8 percent increase in sales. Putnam and Johnson counties’ pended sales, in contrast, decreased by 31.7 and 14.2 percent, respectively, compared to August 2016. In keeping with the previous month’s trends, homes sold more quickly and for more money in August, signaling that it’s still a strong seller’s market. Twelve of the 15 counties that F.C. Tucker tracks showed an uptick in average year-to-date home prices. Hamilton County again ranked highest with average home prices at $303,404. Boone County’s average home prices, slightly lower than Hamilton County’s, came in at $299,743. Jennings County’s average home price dropped 3.9 percent and Shelby County’s dropped 0.1 percent, the only two counties in the region to dip in August. 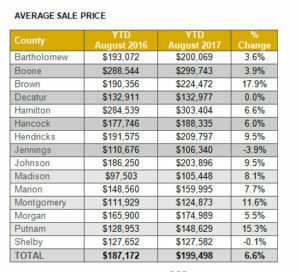 Decatur County’s average home price remained nearly level with August 2016. Homes sold in 61 days on average – and 11 days quicker – for the first eight months of 2017 compared to the same time period last year. Hendricks and Johnson counties’ homes remained the fastest-selling in the market at 56 days, while Hancock, Marion and Hamilton came in close behind with homes selling in 57, 58 and 59 days, respectively. Listings dropped by 14.3 percent. In August 2017, inventory stood at 8,720 homes, a decrease of 1,450 compared to August 2016. None of the 15 counties that F.C. Tucker tracks showed an uptick in active listings compared to August 2016. Boone County’s listings were level to the same time last year, with 350 homes available for sale. Decatur County’s inventory dropped 30.3 percent, representing 40 fewer listings compared to August 2016. Not far behind, Montgomery and Jennings counties’ inventory dropped 26.3 and 26.2 percent, respectively, representing 51 and 22 fewer listings. Of the pended home sales in the region last month, three were priced over $2,000,000; 16 were priced $1,000,000 to $1,999,999; 116 were priced $500,000 to $999,999; 385 were priced $300,000 to $499,999; 538 were priced $200,000 to $299,999; 1,334 were priced $100,000 to $199,999; and 675 were priced at $99,999 or less. F.C. Tucker Company’s monthly real estate market stats indicated the housing market is still going strong. April 2017 pended sales climbed 5 percent compared to April 2016. Similarly, the average year-to-date home price for the 15-county Central Indiana region rose 6.8 percent to $188,583. • Decatur County showed staggering growth in homes sold, a 125 percent increase in April 2017 compared to April 2016. Brown County came in second with a modest 36.4 percent increase in sales. • Putnam and Morgan counties’ pended sales, in contrast, decreased by 20 percent and 13.1 percent, respectively, compared to April 2016. In keeping with the previous month’s trends, homes sold more quickly and for more money in April, signaling a strong seller’s market. • The average year-to-date price in the 15-county region increased 6.8 percent, now at $188,583. • Hamilton County again ranked highest with average home prices at $293,400. Boone County’s average home prices, slightly lower than Hamilton County’s, came in at $285,069. • Two counties showed slight dips in average home prices. Jennings County’s average home price dropped 3.5 percent, while Shelby County’s average home price declined 2.9 percent. • Homes sold in 74 days on average in April 2017, 10 days quicker than this time last year. Johnson County homes became the fastest-selling in the market at 66 days with Hendricks County coming in a close second at 67 days. Listings dropped a significant 21.2 percent. In April 2017, inventory stood at 7,902 homes, a decrease of 2,127 from the same time in 2016. • Morgan and Montgomery counties’ inventory dropped 28.3 percent and 28.2 percent respectively, representing 104 and 51 fewer listings compared to April 2016. • Conversely, Jennings County alone noted an uptick in listings last month; the additional 12 homes on the market in April represented an increase of 32.4 percent. “Going into this traditionally popular sales season, pent-up demand for homes demonstrates today’s housing market is not slowing down. Buyers with their financing in order, paired with sellers who price their homes appropriately, are finding success,” said Jim Litten, CEO of F.C. Tucker Company. Of the pended home sales in the region last month, one was priced above $2,000,000; six were priced $1,000,000 to $1,999,999; 100 were priced $500,000 to $999,999; 397 were priced $300,000 to $499,999; 653 were priced $200,000 to $299,999; 1,446 were priced $100,000 to $199,999; and 699 were priced at $99,999 or less. F.C. 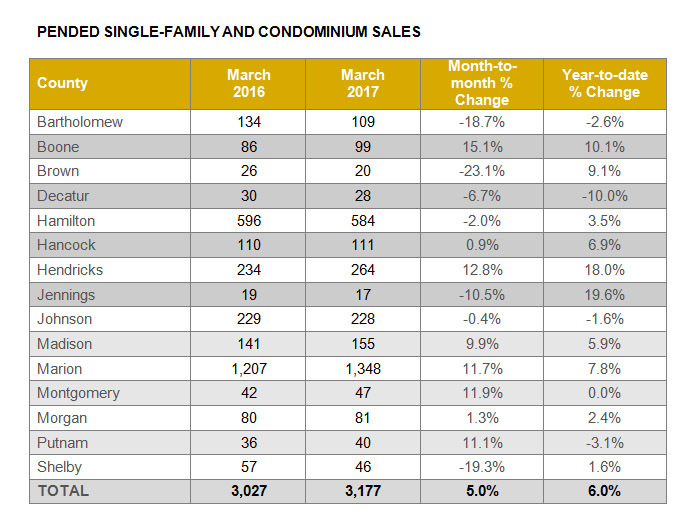 Tucker Company’s monthly real estate market stats indicated the housing market is still going strong. March 2017 pended sales were up 5 percent compared to March 2016. Similarly, the average year-to-date home price for the 15-county Central Indiana region rose 7 percent to $185,819. • Boone and Hendricks counties showed moderate growth in homes sold. 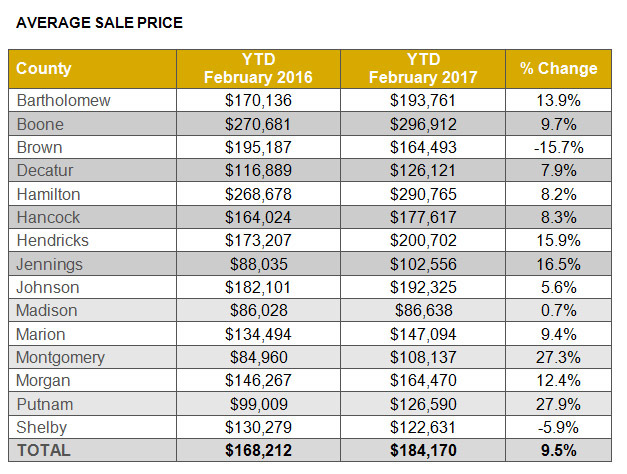 Boone County’s sales increased by 15.1 percent in March 2017 compared to March 2016, and Hendricks County’s sales increased 12.8 percent. • Brown and Shelby counties’ pended sales, in contrast, decreased by 23.1 percent and 19.3 percent, respectively, compared to March 2016. In keeping with the previous month’s trends, homes sold more quickly and for more money in March, signaling a strong seller’s market. • The average year-to-date price in the 15-county region increased 7 percent, now at $185,819. • Hamilton County took back the rank of highest average home price at $291,881. Boone County came in second at an average price of $282,434. • Two counties showed dips in average home prices for a second month in a row. Brown County’s average home price dropped 8.1 percent, while Shelby County’s average home price declined 7.1 percent. • Homes sold in 77 days on average in the first quarter of 2017, 11 days quicker than this time last year. Jennings County homes remained the fastest-selling in the market at 66 days. Hendricks County homes sold in 70 days on average, and Johnson County, similarly, saw homes sell in 71 days on average. Listings dropped a significant 18.3 percent. In March 2017, inventory stood at 7,844 homes, a decrease of 1,756 from the same time in 2016. • Madison County’s inventory dropped 29.8 percent, representing 159 fewer listings compared to March 2016. • Conversely, Jennings County alone noted an uptick in listings last month; the additional 16 homes on the market in March represented an increase of 44.4 percent. “Due to a lack of winter, the 2017 home-selling season started about two months earlier than usual, leading to a strong housing market for spring and a positive outlook for the entire year,” said Jim Litten, CEO of F.C. Tucker Company. Of the pended home sales in the region last month, 12 were priced $1,000,000 to $1,999,999; 111 were priced $500,000 to $999,999; 400 were priced $300,000 to $499,999; 543 were priced $200,000 to $299,999; 1,406 were priced $100,000 to $199,999; and 705 were priced at $99,999 or less. e year-to-date home price for the 15-county Central Indiana region rose 9.5 percent to $184,170. Putnam and Jennings counties showed significant growth in homes sold. Putnam County’s sales increased by 63.6 percent in February 2017 compared to February 2016, and Jennings County’s sales increased 57.1 percent. Decatur and Madison counties’ pended sales, in contrast, decreased by 21.7 percent and 9.6 percent, respectively, compared to February 2016. In keeping with the previous month’s trends, homes sold more quickly and for more money in February, signaling a strong seller’s market. The average year-to-date price in the 15-county region increased 9.5 percent, now at $184,170. Boone County took back the rank of highest average home price at $296,912. Hamilton County came in a close second, however, at an average price of $290,765. Worth noting, two counties showed dips in average home prices. Brown County’s average home price dropped 15.7 percent, while Shelby County’s average home price declined 5.9 percent. Homes sold in 78 days on average, the same as last month. Jennings County homes remained the fastest-selling in the market at 57 days. 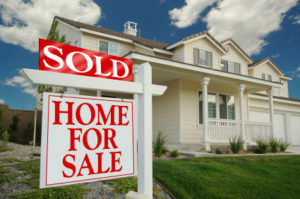 Hendricks and Johnson counties both sold homes in 72 days on average. Hamilton County, similarly, was close behind at 73 days on average. Listings dropped a significant 18.7 percent; 7,500 homes were on the market in February 2017, a decrease of 1,720 from the same time in 2016. Putnam County’s inventory dropped 27.9 percent, representing 53 fewer listings compared to February 2016. Conversely, Jennings County alone noted an uptick in listings last month; the additional 22 homes on the market in February represented an increase of 64.7 percent. Of the pended home sales in the region last month, two were priced at $2,000,000 and above, 12 were priced $1,000,000 to $1,999,999; 83 were priced $500,000 to $999,999; 280 were priced $300,000 to $499,999; 421 were priced $200,000 to $299,999; 1,089 were priced $100,000 to $199,999; and 610 were priced at $99,999 or less. The housing market continues to recover and the values that we lost in 2008, we have now gained back. We are at 3 months inventory with homes that are currently for sale, so it still is a seller’s market with inventory of homes on the market low. If you know anyone or if you are even thinking about listing your home, contact me at 317-698-7109 or [email protected] and we can at least talk about it to see if it would be beneficial for you to consider a move. If you know someone that is thinking about it, I would love to talk with them. You’ve come to the decision that it is time to buy a home. Where do you start? Most people download the most current apps and start browsing and saving their favorite homes. A couple of days go by or maybe even a couple of weeks and they find out you favorites are either already pending or weren’t even really for sale in the first place. Real Estate markets throughout the country, not just in our local market, are seeing very low inventory, coupled with low days on the market. This has buyers scrambling to find the homes that hit the market immediately so they can make an offer right away. After many years of working with buyers I’ve seen buyers unknowingly waste a lot of time and get very frustrated with some of their searches. So I’m going to give some tips on how to create a Great Home! 1. Pick your home search tool wisely. There will be many options for you on the internet to pick from, but they are not all created equal. So what does this mean for you? For example I have a listing that goes on the market, but some of the national websites, might not post my listing for 12 hours, 24, hours and even longer. My listing has four showings in the first few hours and then an offer and under contract before you would even see it. How disappointing if you were only relying on those national sites. You never even had an opportunity. So where do you go to look for homes? Go to your local real estate agents website and create a search there. 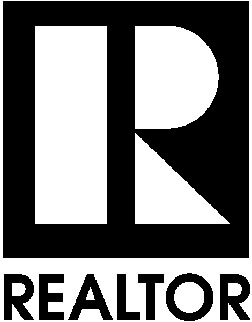 My website, www.kammeyerrealtygroup.com, updates every 15 to 20 minutes. Listings will be there within 15 minutes from going on the MLS. 2. Don’t be too selective with the criteria. With the market inventory low, know what your needs are, but you may have to readjust or open up your search more, depending on what you are experiencing in your market. 3. Keep in mind that agents share all of our listings with each other. We pull data from the same source so the likelihood of you finding that one listing that no one knows about is really slim to none. So there is no need to jump from site to site. Whatever site you like you can stick with it. 4. In today’s world a lot of sites are listing homes that are active/contingency or active/backup, or pending, or listings that aren’t available and this is very confusing for buyers. So whatever site you are using make sure you understand the subtitles. 5. Once you have the site you like and are comfortable with, then set up an email alert. At first you will see old inventory, but after that you will be alerted to anything that is new to the market or any price reductions. My final thoughts…just know the local market conditions. If you’re in a seller’s market, then you need to be diligent about watching your emails and not waiting to see the homes. One or two days and the home you want could be gone. During a buyers market, one or two days could be just fine. Having a little understand and knowledge goes a long way and knowing there is such a lag time with some of the national home search sites, will help with finding your next home. If you want to learn more about the home buying process, contact me at [email protected] or call me at 317-698-7109!